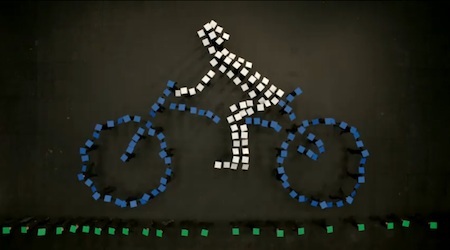 Below is fun, new stopmotion video from Earth Hour for the 2011 event. Earth Hour is just around the corner now, next month at 8.30pm, Saturday 26 March all over the world. Since 2007, it has grown to become a massively popular event. This year, as well as turning our lights off, we are being encouraged to go beyond the hour – to do more by taking action in our daily lives to benefit the planet. We’re also being encouraged to share our stories, thoughts, ideas, images and video on beyondthehour.org. On the site, we are asked: “How will you go beyond the hour to help the Earth?”. I think it’s a good thing that people are being encouraged to go beyond the largely symbolic action of turning lights off this year. At this point, we are in fairly large doo-doo, with all sorts of nasty records continuing to be broken all over the world. And as experts continue to point out, it’s going to take nothing less than fundamental worldwide change to turn things around. It’s going to take significant change on the part of individuals, organizations, businesses, and governments to make it happen. The world is simply not doing enough or moving fast enough, yet. Participating in Earth Hour, and then going beyond the hour to do more, is surely not a bad place to start? Disclosure: I worked for Earth Hour Global in 2009. Let’s surpass ourselves. Let’s try to save energy on a daily basis for an entire year, that is until the Earth Hour 2012.Let’s spread the word around using the social media. Oh it’s most definitely a largely symbolic action – a kind of show of numbers as to how many people want action on climate change. I think symbolic actions are important, especially at the beginning of social movements, like this is going to need to be.